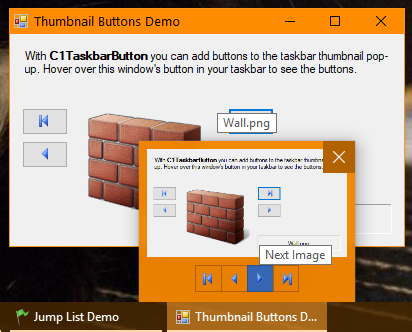 With these controls, you can easily manage progress indicators, thumbnails, and jump lists on the Windows taskbar. You can also use these controls to create and display custom dialog boxes. 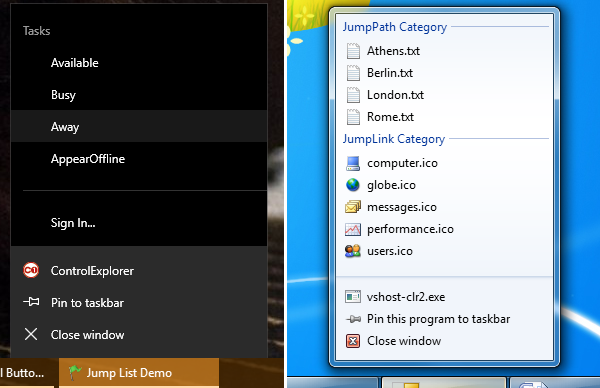 Jump lists display when you right-click your application's button on the Windows taskbar. They allow quick access to recently used files or frequently used commands within your application. TaskbarButton enables you to manage your form's jump list, which can include lists of items or tasks. With TaskbarButton, you can easily display progress indicators within your application's taskbar button. Manage the progress value and choose a predefined state: Normal (Green), Error (Red), Paused (Yellow), or Indeterminate (Marquee). 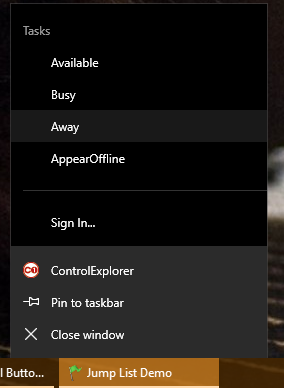 Add and manage thumbnail buttons in the taskbar button flyout with TaskbarButton. You can also customize the application thumbnail image. With TaskbarButton, you can show an overlay icon on the taskbar button. Use this feature to show status updates to the user even when the application is minimized. Create and customize task dialog boxes without much effort. 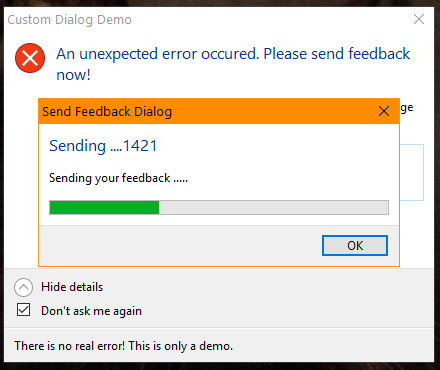 The TaskDialog component works like the common Windows dialogs and the OpenFileDialog. You can set a few properties then simply call the Show() method to display the dialog at run time. With TaskDialog, you can completely customize the buttons on the dialog by just setting a few properties. Add custom buttons, radio buttons, check boxes, hyperlinks, expandable footer areas, a progress bar, and more. Windows Control Pack for WinForms can be run on Windows 7 OS or higher to see the features of TaskbarButton and TaskDialog. Clients who do not meet the requirement will simply not see the feature, with no crash or exception. Windows Control Pack for WinForms honors current OS and client settings. So the same code will show appropriate results on different machines.